Here's the most recent comic for Investing.com. 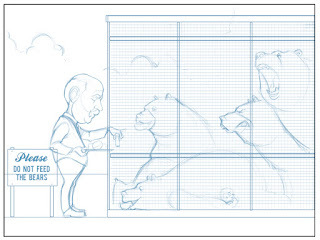 This week's subject (authored by the crew at Investing.com) deals with the effect Ben Bernanke is having on the markets. I think the comic suggests that the markets are primed to fall and would be doing so if Bernanke wasn't using quantitative easing to influence things. I'm afraid I'm not informed enough about quantitative easing in order to posit a coherent opinion about the matter. I do, however, have an opinion about the illustration itself: I think it turned out nicely. At this point, it's probably even money as to whether or not I'm going to like my drawing of the Investing.com comics from week to week. The past couple of weeks haven't been my favorite. Of course, my excuse is that I don't always have the time to draw the comics as well as I would like. A second excuse is that, because I don't choose the subject or the elements of the cartoons, I'm further removed from control over the outcome. But ultimately I'm in control of the quality of the illustration itself. This means not only how well the subjects are drawn, but also little details like facial expressions, body language, scenery details, etc. So in those respects, I have both a literal and a metaphorical hand in the quality of the comics. 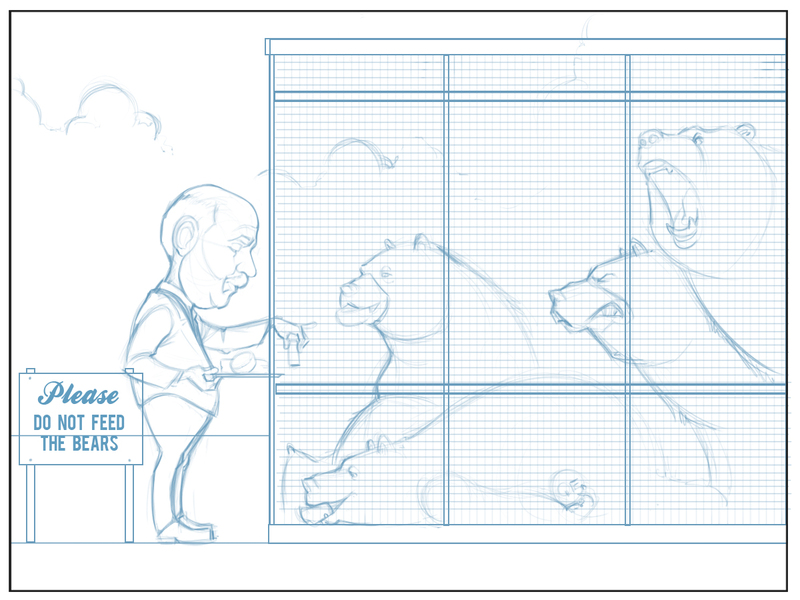 It's interesting to see a body of work develop, as in the case of the Forex/Investing.com comics. I can look at all the comics done so far (I think there are around 35 at this point) and notice aesthetic/artistic changes between the oldest and newest drawings. I'm more comfortable experimenting with certain elements (the color of the sky, for instance, used to only be blue. Blue blue blue, as if that was the only color the sky ever was). But it's also interesting for me to think about what it means to draw a comic every week over a long period of time. I mentioned earlier how I'm not always satisfied with the result of the financial comics. This is partially the result of drawing on schedule. I'm still appreciative to have the work and excited that I get to draw for a living. But I don't always wake up Wednesday mornings and feel excited or even ready to draw. However, because I don't have a choice, sometimes that effects the quality of the illustration. Or, at least it can have an effect on how I feel about the quality of the illustration. This kind of relationship with drawing is a new one for me, and it's a work in progress. I want to always love drawing and always love the way my drawings turn out. Not just for my own amusement, but also because when I have a great time drawing something it means I hand over a better quality illustration to my clients. Ok. Enough exposition. Here's the sketch and the final. 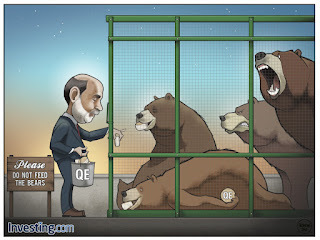 What I like: Bernanke's expression (in particular, the fact that he looks like he's preoccupied with what he's doing), the bears' expressions, and the twilight sky.